There has been much publicity in recent years concerning the identification of Jebel al-Lawz as Mt. Sinai. Although this idea is not new, it has been given new life by two adventurers, Robert Cornuke and Larry Williams. Although present knowledge does not allow us to pinpoint the exact position of Mt. Sinai, we can ascertain its general location from data given in the Bible. The Bible tells us exactly how long it took the Israelites to travel from Mt. Sinai to Kadesh Barnea. Knowing their approximate rate of travel provides a rough calculation of the distance traveled. This places Mt. Sinai in the general area of the northern Sinai Peninsula, not in Saudi Arabia. Scholars have paid scant attention to this important information in their efforts to locate Mt. Sinai. professor of Historical and Biblical Geography, Tel Aviv University. Individuals traveling in the Sinai on camelback average about 20 miles per day, or a little less (Davies 1979: 95-96). Donkey and camel caravans can average between 16 and 23 miles per day (Davies 1979: 96; cf. Beitzel 1985: 91), depending upon the terrain. Early in the 15th century BC, the Egyptian army under the leadership of Tuthmosis III averaged a commendable 15 miles per day in traversing the relatively easy coastal route from the eastern border of Egypt to Gaza (Wilson 1969: 235, n. 16). Once they left Gaza, however, and began to negotiate the rugged terrain of central Canaan, their rate decreased to 7 miles per day (Wilson 1969: 235, n. 18). We have another record of a long journey made by a large number of people in Biblical times. This was the trip made from Babylon to Jerusalem by Ezra and a group of Jews returning from Exile. They left Babylon on the 12th day of the first month (Ezr 8:31) and arrived in Jerusalem on the first day of the fifth month (Ezr 7:9). The total elapsed time for the expedition was thus 121 days less 11, or 110 days. Allowing 15 days for Sabbath rest gives 95 travel days. The total distance covered was ca. 900 miles (The NlV Study Bible, note on Ezra 7:7-9), resulting in an average of 9.5 miles per day. Ezra and his company were following a well-traveled route without flocks and herds and thus were able to achieve a respectable rate of travel. A large group of pastoralists moving with their possessions and animals can cover no more than 6 miles in a day, and usually less (Conder 1883: 79; cf. Beitzel 1985: 91). The limiting factor is the animals. When the Israelites left Egypt, they had "large droves of livestock, both flocks and herds" (Ex 13:38). Adequate sources of water had to be sought for them along the way and time had to be taken to allow the flocks and herds to graze as they traveled. A crucial Biblical text for locating Mt. Sinai is Deuteronomy 1:2. Here it states that it took 11 days for the Israelites to travel from Horeb (Mt. Sinai) to Kadesh Barnea in the northern Sinai. This limits the location of Mt. Sinai to 60 or so miles from Kadesh Barnea. The straight-line distance from Jebel al-Lawz to Kadesh Barnea is approximately 150 miles. Allowing for diversions to find water, twists and turns, and ups and downs, the walking distance would be much greater. This is much too far for the Israelites to travel in 11 days. Even more devastating to the Saudi Arabia theory is the yam suph (Reed Sea) crossing. According to the Bible it occurred at the beginning of the journey shortly after the Israelites set out from Ramesses (Ex 12:37; 13:20-14:2; Nm 33:5-8). The Saudi Arabia theory places the yam suph crossing near the end of the journey at the Strait of Tiran at the southern end of the Gulf of Aqaba, some 350 map miles from Ramesses. There is no way the Israelites could have reached the Strait of Tiran within a few weeks after having left Egypt. The traditional site of Jebel Musa cannot be Mt. Sinai either. The distance from Jebel Musa to Kadesh Barnea is about 160 map miles, again much too far for the Israelites to trek in 11 days. Utilizing the travel time of the Israelites as an estimate of the distance traveled, the location of Mt. 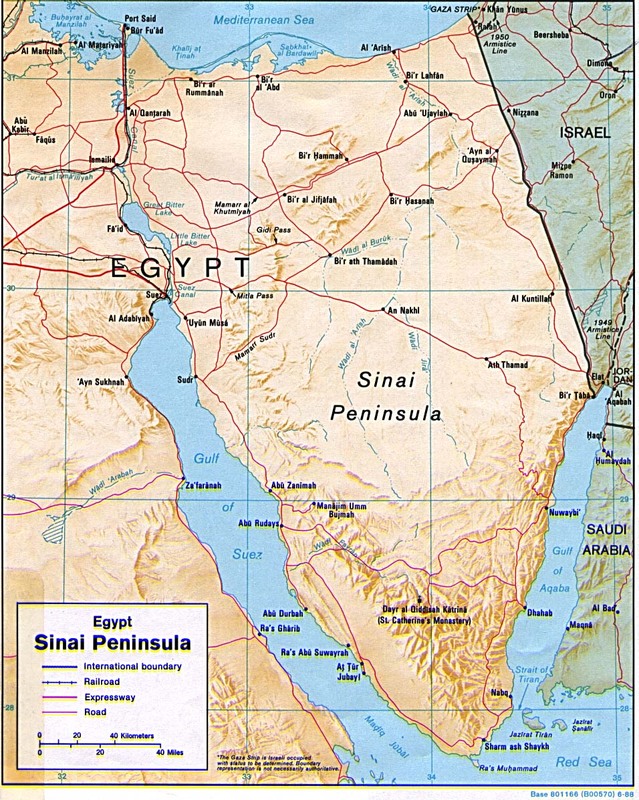 Sinai should be sought in the northern area of the Sinai Peninsula, roughly 60 miles from Kadesh Barnea. Biblical archaeologists have gathered archaeologist data with painstaking effort and scholarship. Their work validates the accuracy of the Bible. Yet mostly within a single decade, Ron Wyatt sought out and claimed the most amazing Biblical sites and relics. The sensational discoveries claimed by Wyatt number nearly 100 and include such things as the Ark of the Covenant, anchor stones from Noah's Ark, a book of the law written by Moses, and the original Ten Commandments in stone. Also Christ's literal living blood, fences from Noah's farm, the Golden Censer, Goliath's sword, the graves of Korah and friends, the Table of Showbread, and the wheels of Pharaoh's chariots (Standish, pages 7-10). These are only the beginning. It is unfortunate for those who love the Bible that all of these incredible claims are almost certainly fraudulent. A great criticism leveled at Mr. Wyatt has been that his "evidence" has generally been in the form of either photographs or nonconclusive specimens, which may or may not have come from the source he claims. His "findings" have not been given independent confirmation by other researchers with specialized training in the fields of archaeology and related sciences, which Mr. Wyatt (a nurse anesthetist by profession) did not have (he died in 1999). This lack of specific education by itself would not invalidate his findings if they could be supported by others, but they cannot. In this book, the Standish brothers examine the Wyatt claims in-depth, going beyond his videotaped claims. These findings can serve as a benchmark upon which Ron Wyatt's "discoveries" can be more carefully evaluated. In 58 easily-read chapters the Standishs meticulously, painstakingly examine in detail all of Wyatt's claims. 1985 The Moody Atlas of Bible Lands. Chicago: Moody. 1883 The Exodus. Palestine Exploration Fund Quarterly Statement 1883: 79-90. 1979 The Significance of Deuteronomy 1.2 for the Location of Mount Horeb. Palestine Exploration Quarterly 111: 87-101. From the map it is obvious that both proposed mountain locations are equadistant from Kadesh Barnea. Yet you offer no proof of your location of Kadeah Barnea, which is a critical component of your logic. Also, you are picking and choosing which of the "miraculous" elements to discount, so that it fits your logic scheme. If you are going to accept that there was a Red Sea crossing at all, then you must also accept that the cloud by day and fire by night "leading them" would have some effect upon their rate of travel. Thanks for commenting on our website. We appreciate your interest. Perusing through Dr. Wood's brief article, we see know rejection of the supernatural acts of God, nor His superintendence over the events connected to the Exodus. The cloud by day and fire by night certainly happened, but we fail to see how these phenomenon could have substantially increased the ability to move through the Sinai with women, children, elders and animals, not to mention finding water along the way. It certainly would not provide enough time to travel from Kadesh Barnea to Jebel Al-Lawz in Saudi Arabia in 11 days. Additionally, the location of Kadesh Barnea is well-established through historical and archaeological records. The onus is on the proponent of the Saudi Arabia theory to demonstrate: 1. The currently accepted location is incorrect and why. 2. A new proposed location with evidence to back it up. We refer our visitors to other in depth articles that further show that the Saudia Arabia theory is untenable and should be rejected. We hope this is helpful in your research. Your analysis cites the limits of travel but does not do justice to the math when calculating the possibilities. If traveling 11 days, then the distances traveled has been documented to vary from 66 to 253 miles. It is not unreasonable to assume that a group of (now) nomadic people could make adjustments to the situation when traveling. Secondly, you also assume worst case in the route around the edge of the Sinai (so-called) peninsula. That does not do justice to the Biblical record when God said that Pharoah would say "They are entangled in the land, the wilderness has shut them in". Therefore the 350 miles calculated as the distance traveled are excessive. The distance through the canyons across the Sinai is much shorter, the Sinai itself being about 100 miles across at the mid-point. This makes more sense when you factor in the fact that Midian (Moses 2nd homeland, and the place where his father-in-law Jethro resided) was just across the Gulf of Aqaba from Nuweiba. In fact there is a modern road that follows just this cross Sinai route. Modern roads have more restrictive grade constraints than flocks and foot traffic, or people on horses and camels. In addition modern roads are often built on ancient by-ways in use for millenia. It is not unreasonable to assume that Moses would have knowledge of these routes, as he has spent the first forty years of his life in the royal house with access to travelers, the military etc. There are ancient Egyptian forts along some of these routes. Also Moses had fled under duress across this very route when avoiding a murder charge in Egypt earlier in his life. Moses's knowledge is a moot point in any event, as the pillar of cloud by day led them through the wilderness. So if you factor in the motivation that this group of people are being pursued by the army of Pharaoh, then nine miles per day is not out of the question. Further to say that they could only make the minimum documented travel per day, and that they must take the most circuitous route seems like making the facts serve the desired outcome. Another miraculous aspect of Israel's travel during the time in the wilderness is that their shoes did not wear out. This is attested to more than once in the Biblical record. The implication is that during their travel they somehow avoided cutting their shoes on rocks etc. If you accept the miraculous, then this seems to point to special grace for travel. Again I would say it is not unreasonable to chose the middle ground on distance if there is special grace for travel. Wouldn't a more moderate approach be to take the extremes out of the equation? Thanks for contacting us and for your question. This is an often asked question, so I have included an excerpt from Gordon Franz's article to explain the reference, and well as links to other articles that discuss the subject more in-depth. The apostle Paul, under the inspiration of the Holy Spirit, informs us that Mount Sinai is in Saudi Arabia. Not Egypt! (Cornuke and Halbrook 2000: 171). The Bible says nothing of the sort. Granted, the Holy Spirit could have predicted the Kingdom of Saudi Arabia long before it came on the world scene. After all, He predicted Cyrus by name 210 years before he became king of Persia (Isa. 44:28; 45:1; Antiquities of the Jews 11: 5; LCL 6: 315). Yet all the Bible says is that Mount Sinai is in Arabia. Moses never uses the word “Arab” or “Arabia” at the time he wrote the Pentateuch. The words appear later in the Bible (I Kings 10:15; II Chron. 9:14; 17:11; 21:16; 22:1; 26:7; Neh. 2:19; 4:7; 6:1; Isa. 13:20; 21:13; Jer. 3:2; 25:24; Ezek. 27:21). So the Apostle Paul does not have a Mosaic use of the word “Arabia” in mind when he uses the word in Gal. 4:25 because “Arabia” did not exist in Moses’ day. The Galatians 4:25 reference might indeed support the view that Mount Sinai was in Saudi Arabia if the Apostle Paul was looking at a 1990 Rand McNally Atlas. However, it would not be true if he was looking at a First Century AD Roman road map. Although no actual maps of Roman Arabia exist from this period, we do possess the accounts of the contemporary travelers such as Strabo, a Greek from Pontus (64 BC to ca. AD 25). He describes the borders of Arabia as having its eastern border at the Persian Gulf and its western border at the East Side of the Nile River. This means that Strabo understood the entire Arabian Peninsula and the Sinai Peninsula to be included in First Century Arabia (Geography 16:4:2; 17:1:21,24-26,30,31; LCL VII: 309; VIII: 71-79, 85-87). The word “Arab” first appears in an extra-Biblical inscription from a monolith found at Kurkh from the time of Shalmaneser III (853 BC). Throughout the Assyrian period, various Assyrian kings describe the activities of the Arabs, or desert nomads. The first time the word “Arabia” is used as a term for a designated geographical area is in the mid-fifth century BC by the famous Greek historian and traveler, Herodotus (born ca. 484 BC). He traveled to Egypt and wrote about his trip in his book, The Persian Wars. 1. Kadesh-Barnea at 'Ain Qudeis is derived from Gen 14:6-7, Num 13:26, 14:40-45, 20:1-28, 33:18-19, 34:2-5, Deut 1:20, 40-46, Josh 15:1-4, Ezekiel 47:19, 48:28. I don't think the Deut 1:2 argument for limiting Mount Sinai northwards is valid, but the location for Kadesh is pretty much certain. 2. Actually, the Tiran crossing is the least exhausting Aqaba crossing- recall Etham (Ex 13:20-14:3). 3. There is no land bridge at Nuweiba- go to bible.ca, type "Nuweiba" in the search engine, and click on the first result. Then, scroll down to the rebuttal. 4. Under a Nuweiba crossing, the Israelites would have to travel only 4.5 miles per day to reach Jebel al-Lawz, Ron Wyatt's Elim (Tayyib al Ism) would be impossible to reach, and Num 33:10-11 would have to become a mere scribal mistake. First, it's important to note that Deuteronomy 1:2 does not say that livestock could travel the distance from Mount Horeb to Kadesh-barnea in 11 days. Instead, it merely states, "It is eleven days’ journey from Horeb by way of Mount Seir to Kadesh Barnea." The reference could easily be explained as an 11 day journey by foot. Interestingly, that is about the time it would require for a person to travel by foot from Jebel el Lawz to Kadesh-barnea. Note: Roman soldiers were reported to travel 16-20 miles per day. Second, the assumption that Israel traveled from Pi-Ramesses to the Red Sea Crossing (Exodus 12:37; 13:20-14:2; Nm 33:5-8) in a few weeks is wholly contrived and not in scripture. The only reference to time that I am aware of is from 1st century Jewish historian Flavius Josephus; who reported the journey from Pi-Ramesses to Mount Sinai lasted three months (The Antiquities of the Jews, III; II. v. 5). Third, both the Apostle Paul (Galatians 4:25) and Flavius Josephus (The Antiquities of the Jews, IV; IV. v. 7). testify that the location of Mount Sinai is in Arabia (modern day Saudi Arabia). The reference to Saudi Arabia and a 1990 Rand McNally Atlas is clearly a Straw Man Argument. It may be of interest to note that wagon trains on the Oregon Trail which were driven by horses, mules, and oxen often made 10-15 miles per day on a fair weathered day. Some families brought their cattle along as well as goats and chickens and God knows what else.